An unaggressive, bright and clear, sipping-quality rhum agricole that can serve as a bridge between traditional molasses rum and agricoles. Clément holds the dubious distinction of providing one of the first agricoles I ever tried. That was five years (and some change) ago. At the time when I tried that Tres Vieux XO, just about the top of their range, I remember the clarity and smooth brightness of it, and how it flirted with a molasses profile without ever stepping over the line. That rhum was a blend of three exceptional years’ production…the Hors D’Age I was trying this time around was supposedly a blend of the best vintages of the past fifteen years. On the basis of such remarks are high prices charged. Note the “hors d’age” statement – what that means in principle, is that the rhum is aged between three and six years, which strikes me as absurd for a bottle costing in the €90+ range. Still, it is an AOC rhum, Clément is enthusiastic abut the care with which they assembled it, and all in all, it’s a pretty decent dram. Clément has a long history, dating back to 1887 and the purchase of domaine de l’Acajou by Homère Clément. Initially it just produced sugar and raw alcohol, but the demand for liquor durting the first world war persuaded him to upgrade to a distillery in 1917. After the death of Homère, his son Charles took over the business. Credited with developing (some say perfecting) the company’s rhum agricole methodology, he studied distillation at the Louis Pasteur School in France, and named the first bottlings after his father. He subsequently expanded the company by instigating mass exports to France, which became the company’s primary market outside the Caribbean. When he died in 1973, his sons took over, but thirteen years later they sold the Acajou distillery to another Martinique business owned by family friends (Groupe Bernard Hayot, one of the largest family businesses in France), who have kept the brand, heritage and plantation intact and functioning and modernized. The company gained the AOC designation in 1996. Agricoles, of course, even the aged ones, trend towards a certain clarity and lightness to them…one might even say sprightly. The nose on the Homère Cuvée broke no new ground, while still being quite delicious to sniff. It presented a tasty mix of the tartness of freshly pressed apple juice (almost cider-like), and softer tastes of under-ripe apricots, freshly sliced. Some vague grassy hints wafted around, very much in the background, and after a few minutes traces of nuts and yellow mangoes and a little leather and waxy stuff rounded things out. It was quite soft and smooth, with very little sting or bite to it. The golden rum was equally gentle to taste, providing very little aggressiveness even at 44% (unless it was just me and my palate being fireproofed by stronger drinks). The feel on the tongue was quite pleasant, gentle and easy-going to a fault. It started out smooth and then morphed to something drier over time. Sharper tastes of lemon dueled it out with more apples, mint-leaves and green grass, some brine and dates, all of which came together really well, with additional breakfast spices, cinnamon and hazelnuts being in evidence…even some chocolate. I found it, in fact, to be somewhat similar to the XO (they were side by side, so I tasted them both simultaneously, one to inform the other), just not quite as good. Still, even after all those tastes, there was still some faint traces of leather and smoke to round things out, and while I won’t swear to a tinge of molasses in there, it certainly felt like it. The fade was sweet and aromatic, smooth and warm, pretty short, some wood, leather, chocolate and citrus ending the experience. There’s enough good stuff trapped in the bottle to please, even satisfy, just insufficient excitement to make it a ultra-remarkable drink that would score higher. Of course, chosing which vintages to blend into a rhum like this presents its own difficulties to the makers, and I’d never say it was bad rhum: my feeling is simply that the Cuvée had more modest goals than the rather more impressive XO, and aimed no higher. Did I like it? Yes. Enjoy it? Surely. It’s a really well-made AOC rhum for those who like agricoles and displays the hallmarks of time and care and blending expertise. So when I say you won’t feel short-changed by the Cuvée, that’s entirely true…what you won’t be is seriously challenged. Still, just because it doesn’t rise to the heights of its predecessor is no reason to dismiss it out of hand. It’s a worthy addition to the brand. It’s possible that this rhum has been made in order to replace the sadly discontinued XO. Some people disliked the XO (I was initially not enthused myself, though my appreciation grew over the years), and there’s a whole FB thread about varying opinions on the matter; the cynic in me thinks that by not stating which vintages comprise the blend, it allows Clément the freedom to sidestep the issue of what happens when those vintages run out…unlike with the XO, where they couldn’t mess with the assembly because everyone knew which years’ production was inside. I hope the silence on the components of the Homère is more a trade secret than an end run around the buying public. First posted 30 June 2010 on Liquorature. A superlative agricole with good body, marvellous complexity and a really strong, spicy fade; yet not as sweet as some rums drinkers might like. As of this writing I’m not entirely won over by it (or agricoles as a whole), but concede the excellence of its make without hesitation. Abandoned by all the ladies in my family for the afternoon, tasked with making sure my two boys didn’t get into a fight over the Wii, I whiled away the hours by taking an appreciative sniff, slurp and swallow of this expensive rhum agricole from Martinique. At ~$120 from Willow Park, I had to think a bit about it, but the truth was that the Barbancourt had piqued my curiosity about agricole rhums, which are made from cane juice rather than molasses, and seem to be a characteristic of French Caribbean islands. In competition for my dinero had been a rum from India, which I decided to decline, an English Harbour 10 yr old I really agonized over, and one from Barbados, the Doorly’s, which I bought, and which I’ll save for a bit. This rum may actually be the very thing Keenan likes: cheap cardboard packaging and an intriguingly different bottle shape, a foil-lined cork, gold leaf lettering, and a light honey-bronze liquid swirling invitingly within: in other words, some style, but not so much as to suggests excessive add-on cost. It is the top of the line of the Clemente estate on Martinique, founded by Homere Clemente in 1887. It bears the appellation AOC – Appellation d’Origine Contrôlée – just as for fine wine, the AOC guarantees that rhum agricole will have all the characteristics associated with its particular terroir (area of make). Vieux – More than 36 months. Très Vieux, Réserve Spéciale, Cuvée Spéciale, VSOP – More than four years. Extra Vieux, XO or hors d’âge – More than six years. Sometimes there’s also a vintage year. In this case, the blend is of three reputedly exceptional years’ production: 1952, 1970 and 1976. I may be getting better at this, or maybe I just had tasted enough rums by now to get a sense of what to look for. At 44% ABV, I certainly got that: a nose of some sharpness (the 47% Kraken was the same), but care had been taken to tone down that spirity aroma for which I had so marked the Kraken down. Toffee. A slight woodsy backdrop. Smokey, the slightest bit. Honey, crackers, a soft peaches note. Some cane sap and vegetal backdrop. And oh, that burnt sugar taste that was so exactly like the aftersmell of burning canefields at harvest time in Guyana, that it was like I never left (canefields are usually burned before cutting: it removes the undergrowth, kills insects and concentrates the sucrose in the cane). The golden liquid has some density and oiliness — it clung top the sides of the glass like honey, only reluctantly sliding slowly back down on fat slow legs. The taste enhances what the nose promised: a solid, complex feel on the tongue, but not syrupy sweet, a common characteristic of agricole rums. 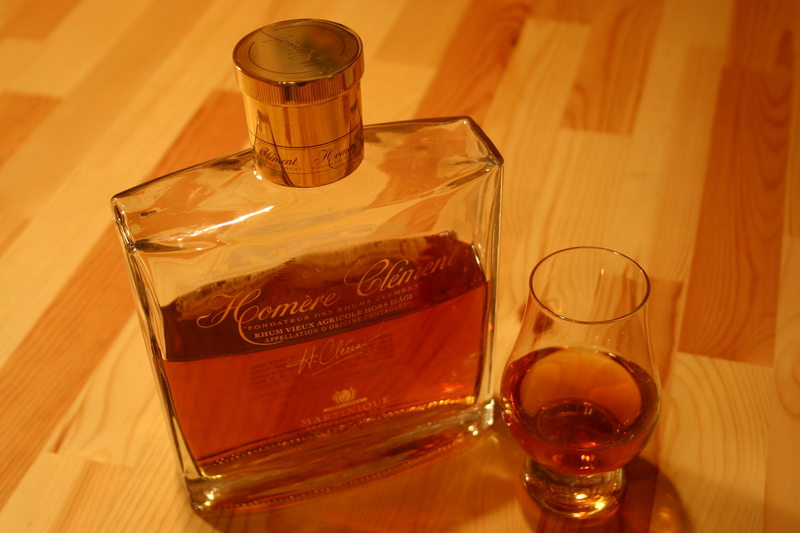 It’s like a good cognac, slightly dry, not marred by excessive sugar. It was a bit like a decent scotch (the Hippie will have to pronounce judgement here), and the flavours were pronounced and distinct: tannins, smoke, light fruit surrounding a solid core of burnt sugar. A slight note of cinnamon. It’s warm on the palate as well, but the finish, if one can take it, is long and sensuous, and burns, but all the way down, leaving a taste of caramelized sugar lingering in the the throat. There’s a clear kind of cleanliness to it, which perhaps won’t be for everyone. For those who like their cheaper tipple to mix, I would not recommend this. Whisky drinkers should go ape for it. 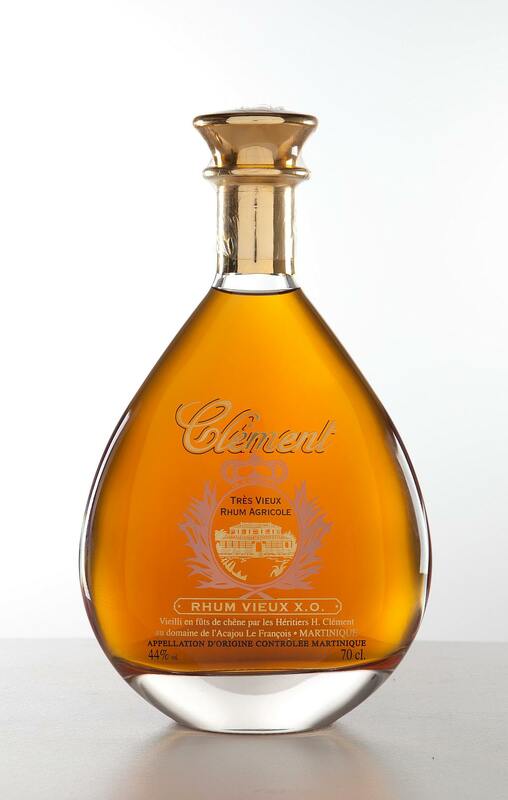 Agricole – or agricultural (made from cane juice), to distinguish them from industrial (molasses-based) – rums are made to exacting standards (they would not have the AOC rating otherwise), and here I’ll have to say that if the Barbancourt and this Clement are representative of the class, then, even with the quality I’ve described, I’m afraid thus far it’s not entirely my thing. The maturation in oak imparts some of that sharpness and tannins to the taste which I’ve never really gotten to enjoy with the passion others do. And that heat so remniscent of whisky. But honesty forces me to concede the quality of other components of this rum: mouthfeel, nose, viscocity and density, and the complexity of the flavours just out of my capacity to separate, blending into a fascinating whole. I don’t think the money was a waste, as nothing that adds to my knowledge and education can be: but I doubt I’ll buy another one of these premium agricole sippers, and after the taste and the thinking and the writing, what I’m really left with is the memories of being ten years old, and, fresh off the plane from Africa, watching the canefields burn, smoke rising from one horizon to the next, the dusk lit with the red glow of dying fires, and the smoke and sugar scent heavy and redolent on the tropical night air. Gimlet eyed readers will note that as the years progressed and my experience and palate grew, I did a one-eighty on agricoles, and these days I think they are a marvellous part of the greater rum world. I guess I had to grow up sooner or later. Based on a retaste in 2014, if I had to score it (at the time this review was written scoring wasn’t part of the review), I’d award 88 points easy, maybe even a shade more.